Over the past decades financial markets have been inundated by an avalanche of liquidity and the financial sector has grown into its current gigantic proportions. This growth of the financial sector has been built on the expansion of debt. Now that debt expansion has reached its limit, the boom has turned into a bust. 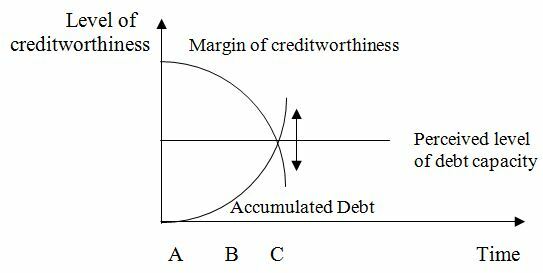 Debt accumulation tends to move in an exponential form. This means that the accumulation starts slowly and over a long period of time. Most of the time it seems as if the debt burden were well under control. At the beginning of long debt cycles existing debt is small by definition while debt capacity is large. Filling this space between the current actual debt level and potential debt constitutes a temptation which is often hard to resist for potential borrowers. Yet debt accumulation implies that a rising debt level diminishes debt capacity at the same pace as debt grows. At the end of the cycle, when the debt crisis has arrived, the borrower is squeezed from both sides. While in the beginning there is space to borrow and the two curves merge only slowly, they finally snap almost abruptly at the end of debt cycle. At the beginning, at point A, debt capacity is at its maximum with actual current debt at its minimum. Even after half of the way of the debt cycle has been taken (point B), current debt is still low and debt capacity is still high. Yet ongoing debt accumulation means that an ever larger portion of the newly contracted debt will go into interest payments. Even if the borrower would stop spending at this point, debt would still rise because of the interest to pay. From point B onwards to the end point at C, the erosion of debt capacity accelerates while debt rises rapidly. Beyond the closing of the debt trap, at the right side of C, debt capacity is negative. The borrower has no longer access to new loans. Voluntary austerity is no longer an option at this point, it has become a necessity. As long as debt levels are low and the perceived debt capacity of government is high, debt accumulation can run smoothly and go on without much disturbance. During the phase of the easy ride of debt expansion large parts of the population tend to perceive government expenditures as a net benefit. Government debt itself has its counterpart in the form of assets in the accounts of the financial system and as financial wealth in the balance sheet of the savers. Debt accumulation by the government feeds the expansion of the financial sector and augments the financial wealth of the private sector. Financing government is a lucrative business. Commercial banks borrow money from their central bank at a low rate and buy government bonds with higher yields. Investment banks make money as intermediaries between private investors and governments. Additionally, the financial sector will expand with the growth of public debt by setting up investment funds for the small private investor. Investment for life insurers becomes a no-brainer as long as they can stock up on apparently save government debt. Government bonds are deemed to be the safest investment because the state is the last to go bankrupt given that the government has authority over its monetary regime. This idyllic situation when government debt is still low does radically change when government is getting close to its debt capacity. Then expansionary fiscal policies tend to work in reverse and monetary policy reaches a dead end. The most massive stimuli only achieve that the system does not implode right away. Investors panic when they learn that government bonds are not risk-free assets. With the approach of the debt crisis, central banks experience their epitome as agents of safeguarding the major players of the financial system along with the government. In order to prevent default by the government and to help financial markets institutions to stay afloat, central banks will create fresh money through the purchase of assets from financial market institutions which in return will deposit this newly acquired cash with the central bank itself. This way the central bank pumps liquidity into the system. The expansion of the central bank’s balance sheet is the mirror image of the creation of central bank money, the so-called monetary base with most of the newly created money now held by the financial sector in the form of excess reserves. Excess reserves are cash holdings that banks do not need in order to fulfill their minimum reserve requirements. 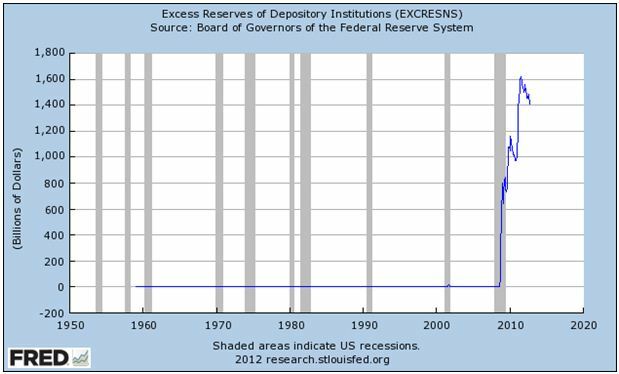 Before the current financial crises commercial banks held excess reserves at their minimum at or close to zero. Now these holdings amount to $1.4 trillion (chart 1). Even in the case that financial institutions and the government were actually insolvent, this policy provides them with liquidity and they can maintain their ability to pay. Commercial banks and other major financial institution can get rid of their bad assets and load them upon the central bank. While financial market players get cleansed this way, the central bank picks up the dirt. In the end it will be the tax payer who has to pay the bill. The main purpose of quantitative easing is to help that the banking sector will stay afloat and prevent government from defaulting. As of now the unprecedented size of monetization of debt has not yet led to rates of inflation commensurate with the monetary expansion. Yet all it takes to make this bomb go off is a somewhat more pronounced price inflation rate that is high enough to trigger greater inflationary expectations. With higher inflationary expectation the financial system will get into a state of feedback that is the opposite of the present situation. While at the moment the multiplier and the velocity of money are low, these variables will rise drastically in the face of rising inflationary expectations. At this stage the debt cycle moves into its final stage as purely monetary phenomenon. When price inflation begins to pick up, the mass of base money which central banks have supplied no longer serves mainly as a cushion to safeguard the banks but turns into financial dynamite that will detonate into uncontrollable monetary expansion. The end stage of the debt cycle takes place as a socio-pathological frenzy to spend as fast and as much as anyone can. Having stacks of liquidity at their disposal mammoth proportions of lending can take place. As soon as the price inflation rate will pick up significantly, more borrowing will occur and when expectations change to anticipate higher prices in the future, a rush to borrow will happen. Once inflationary expectations take hold, it would take drastic increases of the interest rate. One may safely bet that central bankers will be too timid to raise interest rates high enough in order to curb inflation in time out of fear to push back the economy into recession again. When a debt crisis occurs the financial sector comes under pressure and the national central bank will come to its rescue as it is the mission of central banking. Central banks have the ability to monetize debt by buying government bonds and other debt instruments. Banks can get rid of bad assets in return of fresh money which the central bank can create at will. In its early stage this policy of monetization of debt need not lead to price inflation. When lending is still subdued the monetary base stays with the commercial banks and does not yet enter the real economy. This will change when inflationary expectations are on the rise. The ensuing spending frenzy could only be curbed by massive increases of the interest rate. One can make a pretty sure bet that central bankers will hesitate until it is too late to bring down price inflation in time.